Down & Dirty: Thanks for the hospitality. Last day in Santa Fe. Poor me. Actually I feel so rested and relaxed I don't even mind the thought of going back to work. This morning I wandered through my host's garden. She's an amazingly generous woman with a wicked sense of humor. 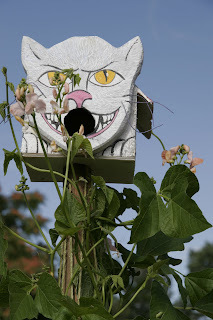 Who else would put up a bird house in the form of a voracious cat?! Her gardens are tremendous: vegetables, fruit trees, sculpture, and of course, some plain, old-fashioned, beautiful flowers. I spend hours there in various uncomfortable positions (with my tripod, on the ground, on a ladder), trying to get the perfect angle on a sunflower or hollyhock. In return for her generosity, I bring her jams and jellies, and this year, my last bottle of raspberry cordial, which I wouldn't waste on just anyone. I wish I could do more, but I've decided to think of this hospitality as a gift. I may not be able to pay Elspeth back directly, but I hope that someday I can be this generous to someone else.